Until recently, almost nothing was known about the status of Hoolock Gibbon in Myanmar. The first modern records on the species in Myanmar were collected in 1983, during assessments for new protected areas in the country. Birdwatching tours became popular during the 1990s and provided occasional Hoolock records, as did more detailed biodiversity surveys. The first dedicated studies of Hoolock were undertaken in two protected areas in the mid 2000s by the Ministry of Forestry and the Wildlife Conservation Society. Surveys indicated larger populations of gibbons, both of the vulnerable Western Hoolock and endangered Eastern Hoolock than were known from neighbouring range countries, but the conservation status of the genus remained unclear. From 2007 to 2011, PRCF and partners began a national status review for the species, providing density estimates for both the Western and Eastern Hoolock Gibbon species in 25 locations. 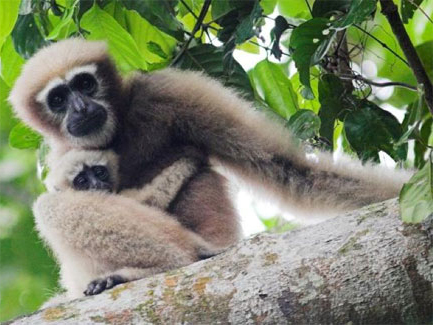 Surveys identified several priority conservation goals for long-term survival of the gibbon. These included to: increase knowledge on distribution and relative abundance of the two species in Myanmar; identify major threats to gibbon populations in Myanmar; raise awareness among stakeholders about gibbon conservation, and develop models for participatory action planning. The 2007-2011 status review indicates that the undisturbed protected forest in the southern Rakhine State on the western coast of Myanmar comprise the largest remaining global Hoolock population. As a fallow-up, PRCF and partners targeted several sites for direct Western Hoolock Gibbon conservation, including Ker Shor Ter and Magentha in Karen state and Indawagyi Wildlife Sanctuary in Kachin state.